Sometimes, the best way to bring closure is to go back to how it all began. 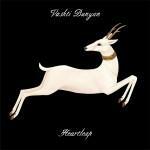 It’s been a challenging nine years for Scottish singer-songwriter Vashti Bunyan to assemble the ten seraphic tracks that make up her latest release, Heartleap. Bunyan herself describes it as the last record of her career, one that has always remained modestly firm yet profoundly simple in the extent of forty four years. The story goes that she said goodbye to the limelight and decided to lead a rural, domestic life after the release of 1970’s overlooked Just Another Diamond Day, a cruel disappearing act that was chiefly due to her self-sabotaging insecurities. With a little help from her new friends, all of them part of the modern psychedelic folk movement, Bunyan made her triumphant return in 2005’s Lookaftering. It was a wildly ambitious endeavor in relative terms, a soft-spoken yet meticulously arranged effort with a chamber feel that gave Bunyan’s intimate thoughts a measurable forcefulness when compared to the lulling acoustic tranquility of Diamond Day. Which wasn’t by any means a step in the wrong direction - Lookaftering is still a lovingly crafted labor of love, a masterful recording that brought great minds to channel Bunyan’s sage contemplations in full bloom. But it wasn’t completely hers. Which makes Heartleap, in many ways, the true follow-up to Diamond Day, solely in how it leaves her to her own creative devices instead of refining them through a collaborative process. It’s impossible to think that the unadorned beauty of Heartleap could’ve taken so long to produce, until we learn that Bunyan edited and recorded the bulk of it through her own means. Instead of convincing herself that she lacks the ability to write a song, let alone play the piano with both hands, she went through the painstaking process of piecing together sound fragments with careful attention to complement those spare acoustic parts. Heartleap aims for a “less produced”, more natural sound, and Bunyan’s courageous conceit never feels even remotely imprudent considering the drawbacks of too much creative freedom. It could never be - the sparkling acoustic flutter of Across The Water is uttered no louder than a faint whisper, while the powerful Holy Smoke, about finding one’s own strength when we feel responsible for the unhappiness of others, carefully balances a gentle fingerpicking strum with an elegiac keyboard melody. Still, it’s Bunyan’s tenuous voice that soars, and in Shell, there’s a tone of reminiscence in her bittersweet delivery as she pursues a long overdue absentee in her thoughts (“And I’m here on the foreshore/till your return/I just see a shell”). Bunyan takes from many life experiences to base around her songs, though the insight she gives about many of the subjects that inform the album are mostly implied and not specified. There’s an ambiguity surrounding them, but it doesn’t mean they’re just as felt; for instance, Gunpowder makes it quite clear that she’s alluding to an ex-partner that, even to this day, can’t seem to hold a conversation without it turning into a fiery exchange. Others more clearly advice on the complex dynamic of wishful thinking, like in Blue Shed, which evokes the yearn for peaceful isolation…until it’s gone for good: I wish I had a blue shed with nobody in it/I wish i had a closed door with only me behind/ but all this wishing I might be sorry/Or it could be the end of me. But none are more striking than Mother, a Debussy-like piano piece with a weeping cello in which she conserves a delightful memory of her past. That sense of longing still pervades in Bunyan’s last musical chapter, but the airy, insouciant temperament of Heartleap is one of contentment and deep self-fulfillment. It closes a career path that was meant to cease when she was just hitting her mid-twenties, only to make a surprising reappearance three and a half decades later without ever offering any easy answers or wallowing in the minutiae of it all, always giving strong emphasis to the value of conserving memories. It ended in the only way she ever could - still figuring out life’s ever-changing course whilst taking things day-by-day. Heartleap is a treasure to withhold, and though it's proclaimed as a departure, it feels both complete and satisfyingly open-ended.